There are advantages for Mark and Spencer to employ suitable people. One way is that if the new candidate such as a store manger role, has excellent skills, then they can communicate to staff and members by email or memo, rather than verbally doing this each individual. The advantage is that this saves time. Also skills, this means that when that parson is discussing a matter with shareholders or stakeholders, they would go about it professionally. The advantage of employing all members will find new ideas generated all aspects in clear term. Finding a suitable person that can consider the audience and targets younger people and also all ages when presenting new ideas is an advantage. This presenting new ideas is an advantages. This is because if this necessary change occurs, the organisation such as Mark and Spencer will concentrate such as Mark and Spencer will concentrate on the wider audience. A suitable person in Mark and Spencer will consider all age, gender and ethnicity, including religions. The advantage of having a mentally strong person and also hardworking will mean that this employer is fulfilling his tasks and objectives in Mark and Spencer. They are doing all work at there maximum performance and high potential. Having a person with great motivation in Mark and Spencer is good for the organisation. This is because the person will bring good practice in the work environment with staffs. An Mark and Spencer employee that can communicate in a formal language will show the company’s respect and politeness. This will generate a better reputation for Mark and Spencer. 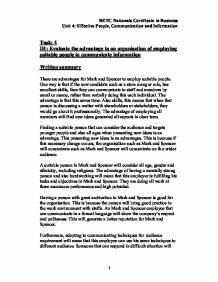 Furthermore, adapting to communicating techniques for audience requirement will mean that this employee can use his same techniques to different audience. Someone that can respond in difficult situation will also be an advantage to Mark and Spencer. This is because they will be able to respond to the needs of their goals and meet the company’s goals. Your attitude to life and work. Interpersonal skills are all about working with other people. They include being able to support and encourage others, being able to give and receive constructive criticism as well as being able to negotiate. They are also concerned with listening to and valuing others' opinions, and being able to convey your point clearly to a group. Employers stress the importance of employees working as a team. For customer assistant it is essential that staff’s work together, in order to make the business more successful. In a general sense people talk of teamwork when they want to emphasise the virtues of co-operation and the need to make use of the various strengths of employees. Interpersonal skills sometimes overlap with spoken communication skills. This is because communication is crucial to good interpersonal skills. Interpersonal skill helps people, sharpens their skills of listening and managing information. Interpersonal skills are especially relevant for sessions relating to customer care, telephone, selling, communication, presentation and problem solving. "A set of achievements, understandings and personal attributes that make individuals more likely to gain employment and to be successful in their chosen occupations"
Employability skills are those skills that are essential and transferable to a variety of situations and are necessary for an individual to function in the 21st century workplace. Employability skills include functional literacy and numeracy, ICT and communication skills. Many of the skills that employers want are the same skills that make good postgraduates such as, willingness to learn, self- motivation, problem solving ability, oral communication, team work, energy and drive. Others, such as commercial awareness and leadership, are the sort of skills you might get from work experience and social or voluntary activities. Effective communication is key in every situation we find ourselves in, whether it is work related or in our personal life. We all know or work with people whom we respect as effective communicators, but what is it about their behaviour that we aspire to and how do they do it? How is it that they are not only able to express themselves fully but can also get to the heart of what’s important to the people around them. Most of us communicate well in many situations however, occasionally we need a little help. The first step is realising that you can learn new communication skills and that these skills are not solely in the domain of gifted communicators. What situations would you find it useful to convey yourself as a confident and articulate individual? Whether you want to communicate with more impact or build rapport with a colleague or client, improving your communication skills will help you meet these challenges. Business report on Marks and Spencer. * How Tesco competes by collecting accurate information: They do give people opportunity to download on their E-mail about any kind of information that could be positive or negative about the business. This is gathered as raw information and enables Tesco to understand what people talk about them. 7.2 Mark and Spencer International retail and franchise businesses have operated 125 franchise stores in 26 countries. The turnover in Europe was increased this year 2000 /2001compared to last year 1999/2000. The turn over in North America (exc. Canada) has also increased compared to last year. The wide difference in pricing is because organisations take into account several factors when deciding what price to charge: * Organisations usually sell goods at a price which covers the costs of production so they can make a profit. Some businesses may sell below cost because they may want to win business from a competitor. I think that Marks and Spencer are on their way towards being successful in meeting their objective for increasing sales; I still think that they are more successful in the international retail. The reason why I think that Marks and Spencer are on their way towards being successful is that on the 6th of November they had their Interim results. of government officials, the appropriate training and addressing the cultural issues of language. The limitations of GIS noticed was the over simplification of the handling of GIS which conceal the importance of data and mapping and that of greatest risk of deduction of causal relationships for mapping. Legal The government introducing new laws which restaurants need to follow so they do not tarnish their reputation and business image Environmental Fire and rocks must stay environmentally friendly by reducing and recycling their waste and disposing of packaging correctly, this will also give them a positive image.